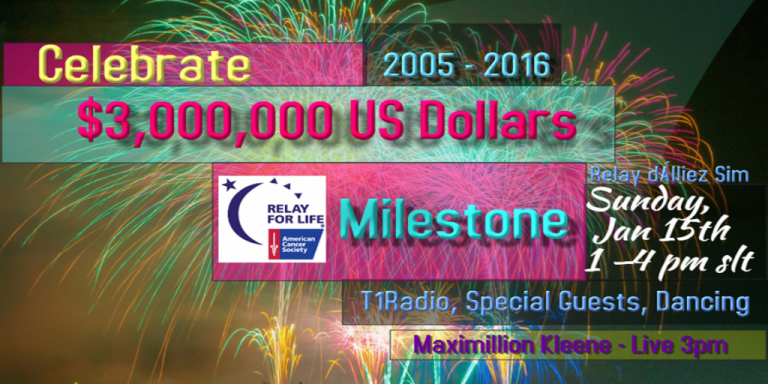 Following the close of the 2016 SL Christmas Expo and final accounting from off-season fundraising 2017 Relay For Life of Second Life Chair Nuala Maracas announced to the RFL community that the milestone of $3,000,000 (USD) all time had been achieved. The RFL community is invited to celebrate this accomplishment at a special party to be held Sunday January 15th at Relay dAlliez. Relay For Life is the signature fundraising event of the American Cancer Society. It began in Tacoma WA in 1985 and is held in more than 5600 communities and in more than 23 countries outside the U.S. Relay For Life of Second Life began in 2005 and raised $5000 that year. The annual event has grown into the largest virtual fundraising event ever. 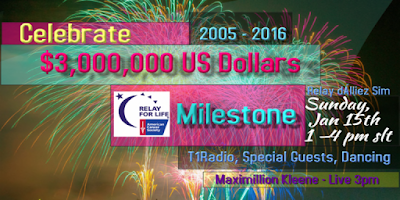 In 2011 the event passed the $1,000,000 total and raised its 2 millionth dollar during the closing ceremony of 2013 Relay weekend. In 2014 the Relay For Life of Second Life raised more than $420,000 and was the ranked 17th largest Relay event in the world. The Thank You Celebration to be held Sunday, January 15th will begin at 1pm slt will be broadcast on T1Radio and will feature special guest performer Maximillion Kleene, a longtime supporter of the Relay in SL. The 2017 Relay For Life season in Second Life will begin with Kickoff on March 5th. Team registration will be announced shortly. Grid residents interested in participating can join the Relay For Life Volunteers group (secondlife:///app/group/7f1cc591-7968-9204-4082-98c7e544c371/about) for more information about joining or starting a team.